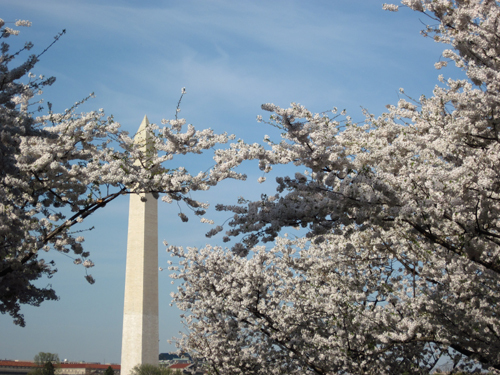 In Fodor’s newsletter they listed the top sites for viewing spring flowers, and Washington, D.C. was one of them. 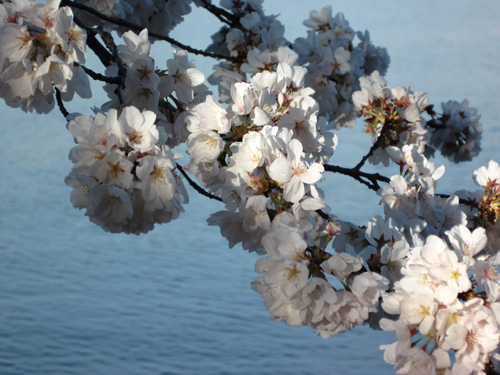 Last spring we visited Washington, D.C. to see the Cherry Blossoms, between March 31st and April 1st. We had seen the cherry blossoms before and thought they were spectacular and felt we were really lucky to hit it at the best time. I don’t usually like to revisit places as they are never quite the same the second time. However, this year they were more than spectacular – it looked like every branch of every tree was in full bloom. I just kept exclaiming how beautiful it was, an ocean of pink and white. The cherry trees were a gift from Japan when, in 1912, 3,020 cherry trees arrived in the U.S. as a living symbol of friendship between the two nations. Ever since, the beauty of the blossoming trees has enchanted visitors and heralds the beginning of spring. 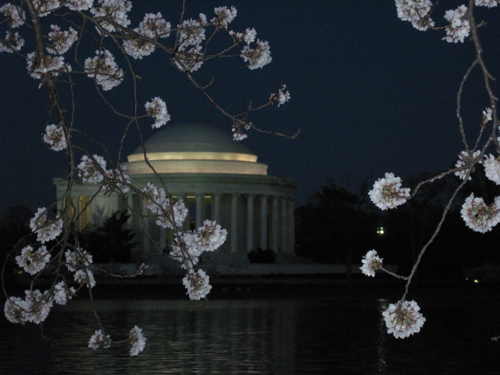 In 1935 the Cherry Blossom Festival was established as an annual event, and during festival time many events take place, such as parades and lantern walks. 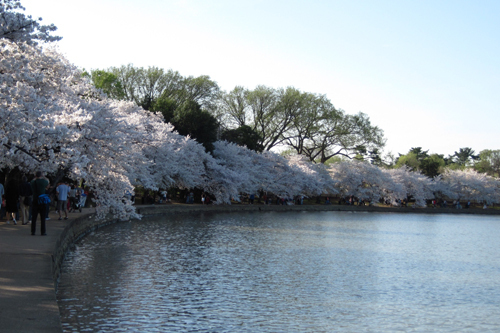 It is said that millions of people come to Washington, D.C. every year to see the blossoms and participate in the many events. 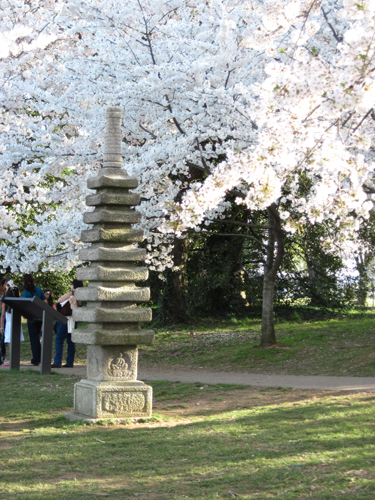 It shows the deep appreciation people feel for the cherry blossoms. They are a real natural treasure. There are different varieties of Cherry Trees. There is the Usuzumi Cherry Trees planted in 1999 as a gift of 50 from the people of Neo Mura Village in central Japan, and the Yoshino Cherry Tree is the predominant species in the park. These are the ones you see planted around the Tidal Basin making it look like fluffy white clouds. There is also a Fugenzo Cherry Tree which is one of the oldest cultivated cherry trees in Japan. These trees have pink double flowers with curved petal tips. Also there are some Weeping Cherry Trees, which are easy to identify with their cascades of pink flowers. To identify the other varieties there are signs. The Akebono Cherry Trees are interesting as it is a pinker version of the Yoshino. The flowers change color during their lifespan-pink buds open and fade to white petals, then turn pink again as they begin to wilt. 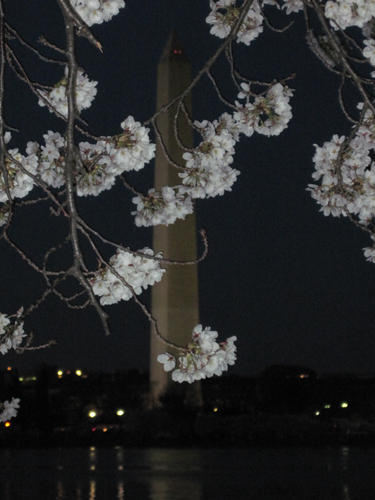 We first arrived in the evening and drove and walked around some to see the blossoms and monuments illuminated. Parking can be a real challenge; you just hope you are in the right place at the right time, when someone is leaving. After driving around a few times we did find a parking spot. We walked over to the Tidal Basin area. Here we had great views of the Jefferson Memorial lit at night. It was beautiful and I just couldn’t stop taking pictures. 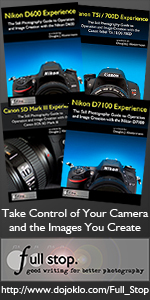 Thank goodness for digital. We returned the next day and walked around the Tidal Basin with the hundreds of other people. It is just such a beautiful sight. You can see it in pictures but it just isn’t the same as being there. Around the FDR Memorial is another good place for viewing and also by the Washington Monument. At one point we saw a newly married couple having their wedding pictures taken under the trees. 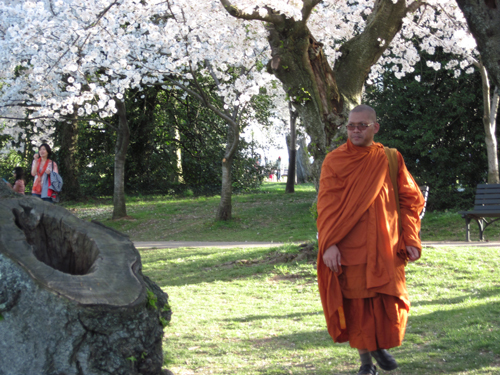 To add to the color there was a monk walking around in his saffron robe.